Brilliantly directed by the young & exceptionally talented Nag Ashwin, MAHANATI is a beautiful biopic of an immensely popular legendary actress of our Indian cinema. And can simply be quoted as a not to be missed 3 hours nostalgic journey back to the decades of 50s and 60s with a worth-praising presentation, cinematography, music and outstanding individual performances by the entire cast. But moving beyond the excellence achieved by the film in its various departments, would strongly like to rate and recommend MAHANATI as an important visual documentation to be essentially seen by the generation born post the 70s or the Black & White era to be specific. Particularly the movie fanatics like us living in other parts of the country, who don’t really have much exposure to the cinema made in the south in those past decades. We do call it the GOLDEN ERA of films in terms of Hindi films, but it happened to be the most important era in cinema made in the South too as showcased in the film featuring renowned stars of those times along Savitri as Gemini Ganesan, Sivaji Ganesan, N. T. Ramarao and more. As an Indian actress, dancer, singer, producer and director, Savitri featured in Kannada, Malayalam and Hindi films too along with the major Tamil and Telugu films. Recipient of many reputed national awards she was a superstar of her times and was also honoured among ‘women in cinema’ in the 30th International Film Festival of India. Facing rejection in the beginning of her career, the actress later achieved such a cult status in Indian Cinema of South that she was also included among the ‘Legendary Heroines of India’ on whom postage stamps were issued by the Government of India in 2011. Known for his acts in about 250 films including many cult and award winning ventures (in just three decade career, that comes to average about 8 films per year), Savitri is also remembered as a noble soul for her philanthropic works who used to help everyone around both in her prime as well as during the downfall seen in the later years. Where getting involved with an already married star affected her professional & private life a lot, she was also betrayed by many of her close associates in the time of crises, that eventually led to addiction to alcohol and a chain of financial issues resulting in her properties being seized by the Income Tax Department. The icon started accepting any and every kind of role in her final years and then left the world at the age of just 45 in 1981, but that too after lying in coma for 19 long months in a small house. The film is a biopic depicting all the above mentioned events as a journey of four decades from the black and white era to the colour, once again bringing the legendary actress alive on screen with all splendid acts superbly led by Keerthy Suresh who amazingly looks similar to Savitri and comes up with a simply magnificent performance winning hearts right from the very first mesmerizing sequence of a film shoot. Keerthy truly loses herself in the character and delivers a poetic act as Savitri (with major look changes throughout), superbly supported by Dulquer Salmaan, Samantha Akkineni, Vijay Deverakonda and other well-chosen performers. Though it’s frankly hard to visualize Dulquer as Gemini Ganesan in the beginning due to the unrelated looks or appearance, but he does complete justice to his role, both in the romantic and tense sequences supporting Keerthy Suresh. Taking us back to the era of an iconic female actor dominating the Indian Film Industry in South, director Nag Ashwin beautifully recreates some of the most famous scenes of her cult films (and some real life events too) with an outstanding onscreen execution wherein every technical department excels in detailing, be it cinematography, camera angles, background score, VFX or above all the makeup and costume designers. The music/songs perfectly build up the mood at various stages of the film and the transition or the changeover to different years (in flashbacks and montages), never makes your feel any sudden jumps in the narration happening so smoothly. In fact that is the reason why one feels like literally transported back to the era reliving the particular time-period when those classics were being actually shot in the studios. What’s even more unbelievable is the fact, that this all has been visualized by just a one film old director, born much after the era displaying a deep understanding of the medium and its technicalities. “There have been countless actresses over the last 80 years in Telugu cinema but none have earned the title of Mahanati (The Great Actress), and even today it has solely been reserved for Savitri. From penniless origin to the first female superstar, her life is quite a story. We are in that moment in time where it’s been long enough that the legends have left us, and we will have to revisit them and understand why they are legends”. Showcasing 45 years of Savitri’s life from childhood to death in around 3 hours of duration, Ashwin presents it as a tragic human drama, honestly including the controversial facts too without demeaning any character or family members. And thus successfully comes up with a responsible, sincere bio-pic without any intentional or biased hiding. Interestingly a few identical sequences in the film also reminds you of Kamal Hassan’s AVVAI SHANMUGHI (CHACHI 420 in Hindi), Mani Ratnam’s IRUVAR and Hrishikesh Mukherjee’s ABHIMAAN too, may be as a homage to the legends by director Nag Ashwin. A masterpiece close to perfection, MAHANATI doesn’t have any major drawbacks or flaws. Though very intelligently and evenly paced, it has a longer length that does seem to be a bit slower in its second half. Plus the NT Rama Rao sequences might look inept to many due to the CGI recreation. Moreover the storyline or proceedings largely remain known and predictable, since this ironically happens to be the tragic story of many screen icons, their individual rise and fall involving a failed marriage and the industry itself betraying them towards the end when they have lost it all. However, these never becomes an obstacle in experiencing this majestic attempt by the team that ideally needs to be seen by every lover of cinema all over the country irrespective of the region or language. It not only enlightens us about our golden past, but also makes us realize what we are truly missing in the present era in our cinema as well as in our icons living a shallow life. Imagine, if me a person living in the North India, not knowing much about the golden era of cinema made in the south could enjoy and cherish the film with tears and goose bumps together, then what would be its impact on the people from the related region & language, very well versed with the key names, era and those mega hit films made in our Indian Cinema. In short, MAHANATI is just not a tragic bio-pic, it actually relives and breathes SAVITRI on screen as a celebration. And therefore finds a respectable place in the Movies To See Before You Die list at BTC both for its informative and cinematic value congratulating the entire team. 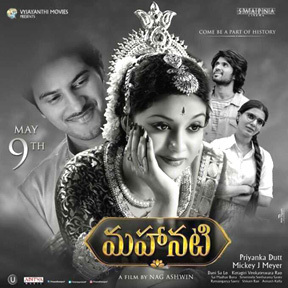 Tags : Mahanati (Telugu) Review by Bobby Sing at bobbytalkscinema.com, Indian Regional Language Films Reviews by Bobby Sing, Telugu Movies Reviews, Indian Regional Language Gems other than Hindi. Rekha, is the daughter of Gemini and pushpavalli (telugu actress), second wife of Gemini, not first wife. Thanks a lot for pointing it out. The mention stands corrected now in the article. Excellent review of a film that seems to have opened up the world of the cinema from the south to the less initiated movie lovers in the North. The film deals with its subject sensitively and so does your review. Enjoyed reading it and it encourages me to watch the film. Thanks! Have been exploring the Indian Cinema in Regional languages since last many years and I will have to say that just watching Hindi Cinema will be like living in a well without knowing what kind of water is available out of it and of what superior quality. Do watch MAHANATI at the earliest as its now available at Amazon Prime with English subtitles. And if possible do spend more time here at the site too, exploring articles on the unmissable Indian Gems made in our regional languages.